Almond nuts are rich sources of vitamins, minerals like copper, magnesium, high-quality protein and packed with numerous health promoting phytochemicals they are one of the complete sources of energy as well as nutrients. Nuts and seeds are the vegetable foods that are richest in fiber after cereals, which could explain why almonds are good for cardiovascular health. Here on this page, we will see important health benefits of Almonds. Almonds are found in places like Iran, Saudi Arabia, Lebanon, Turkey, Syria, Jordan, and Israel. Almonds are the most popular nuts in the United States. One analysis indicates almonds contain 44% oils, of which 62% is monounsaturated oleic acid (an omega-9 fatty acid), 29% is linoleic acid (a polyunsaturated omega-6 essential fatty acid), and 9% is saturated fatty acid. These results are similar to those presented in the table, showing 49% fat content in whole almonds, the majority of which is the monounsaturated fat, oleic acid. Almonds are the oldest and most widely grown of all the world’s nut crops. Eating a handful of almonds per day could bring on many health benefits including improve in Heart Health and helps in weight loss. 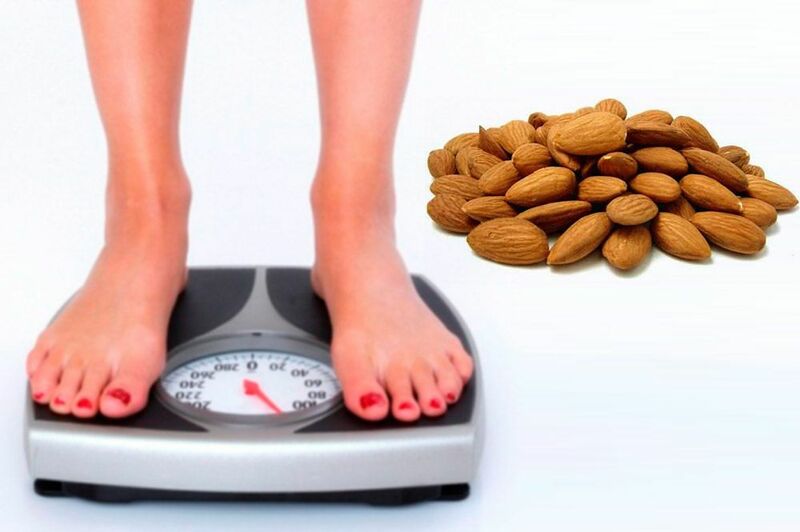 Having almonds in your diet everyday may help decrease abdominal fat, an important risk factor for metabolic syndrome. Almonds contain a fair amount of calories but they are also rich in Vitamin E, fiber, protein and lots of good fats that lower cholesterol and blood pressure. Eat a handful of almonds, in place of your regular snack. They are low in calories, making them perfect for a quick and easy weight loss snack. Adding more almonds to your diet, and particularly eating them in a certain way, can help you to lose weight rather than gain it. Research suggests that almonds may help you eat less because their fiber and protein make you feel full. Almonds are a great source of heart healthy monounsaturated fatty acids, the same kind as those found in avocado and olive oil. Oleic acid is the primary monounsaturated fat in almonds and it has been associated with a reduction in unhealthy LDL cholesterol levels and a lower risk of heart disease. Almonds are also rich in minerals such as manganese, copper and magnesium as well as B vitamins like riboflavin, niacin and biotin. These particular nutrients are integral to the cellular processes that activate energy production within your body. And anything that helps you to feel more active and energetic can only be a good thing for losing weight. Switch over to Almond diet to reduce Belly Fat. Almond benefits include a high protein content that helps in the development of lean muscle mass. The mono-saturated fats maintain and reduce our body mass index (BMI). It targets the fat stored in the abdominal region, thus reducing belly fat. Almond oil is a rich source of vitamin E. Almonds are a rich source of oil, with values ranging between 36 to 60% of kernel dry mass. Sweet almond oil is obtained from the dried kernel of sweet almonds. The oil is good for application to the skin as an emollient and has been traditionally used by massage therapists to lubricate the skin during a massage session. Almonds have long been revered as an epitome of wellness and health. The kernels are among the richest sources of health-benefiting nutrients essential for optimum health. Almonds have been studied extensively for their benefits on heart health, diabetes, and weight management. Almonds are free from gluten protein, and for the same reason, they are one of the popular ingredients in the preparation of gluten-free food formulas. Almond is very useful for a pregnant woman. They are also used in the preparation of desserts, ice creams, cakes, cookies, sweets etc. Almond butter, almond milk, almond flour and almond meal are other very nutritional products produced from them. They are actually stone fruits related to cherries, plums, and peaches. They are also highly regarded in Ayurveda for their nutritional value. According to Ayurveda, almonds help increase high intellectual level and longevity. From our ancestor we are hearing that we have to eat almonds regularly to increase brain power and boost memory. Almonds are always considered one of the best brain foods. Almonds contain number of healthy nutrients that benefits overall health and also boost specific brain functions. Almonds are moderately rich in lean protein which not only gives you a boost of energy but also helps repair brain cells thus improving cognitive functions including memory. 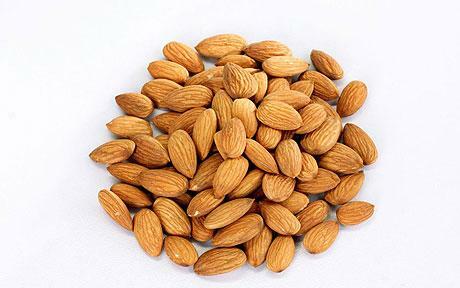 Almonds also contain the mineral zinc that is known to keep up the functioning of your immune system. Zinc is also an antioxidant that fights the free radicals in your bloodstream. These free radicals are responsible for attacking and breaking down brain cells. In addition to that, they are also loaded with nutrients like Vitamin B6 which promotes brain health and Vitamin E that slows down the ageing of brain cells that impact memory. The omega-3 and omega-6 fatty acids in almond help increase intellectual levels and the magnesium in them help strengthen the nerves in the brain. The daily use of almond increases the mind power, memory, gives nourishment to the body and keeps away the diseases.